Ever since the time of Galileo, the history of astronomy has been punctuated by a series of “great debates”—disputes between competing theories of the organisation of the universe which observation and experiment using available technology are not yet able to resolve one way or another. In Galileo's time, the great debate was between the Ptolemaic model, which placed the Earth at the centre of the solar system (and universe) and the competing Copernican model which had the planets all revolving around the Sun. Both models worked about as well in predicting astronomical phenomena such as eclipses and the motion of planets, and no observation made so far had been able to distinguish them. Then, in 1610, Galileo turned his primitive telescope to the sky and observed the bright planets Venus and Jupiter. He found Venus to exhibit phases, just like the Moon, which changed over time. This would not happen in the Ptolemaic system, but is precisely what would be expected in the Copernican model—where Venus circled the Sun in an orbit inside that of Earth. Turning to Jupiter, he found it to be surrounded by four bright satellites (now called the Galilean moons) which orbited the giant planet. This further falsified Ptolemy's model, in which the Earth was the sole source of attraction around which all celestial bodies revolved. Since anybody could build their own telescope and confirm these observations, this effectively resolved the first great debate in favour of the Copernican heliocentric model, although some hold-outs in positions of authority resisted its dethroning of the Earth as the centre of the universe. But Galileo's inference from observing the Pleiades was wrong. The glow that surrounds the bright stars is due to interstellar dust and gas which reflect light from the stars toward Earth. No matter how large or powerful the telescope you point toward such a reflection nebula, all you'll ever see is a smooth glow. Driven by the desire to confirm his Copernican convictions, Galileo had been fooled by dust. He would not be the last. William Herschel was an eminent musician and composer, but his passion was astronomy. He pioneered the large reflecting telescope, building more than sixty telescopes. In 1789, funded by a grant from King George III, Herschel completed a reflector with a mirror 1.26 metres in diameter, which remained the largest aperture telescope in existence for the next fifty years. In Herschel's day, the great debate was about the Sun's position among the surrounding stars. At the time, there was no way to determine the distance or absolute brightness of stars, but Herschel decided that he could compile a map of the galaxy (then considered to be the entire universe) by surveying the number of stars in different directions. Only if the Sun was at the centre of the galaxy would the counts be equal in all directions. Aided by his sister Caroline, a talented astronomer herself, he eventually compiled a map which indicated the galaxy was in the shape of a disc, with the Sun at the centre. This seemed to refute the Copernican view that there was nothing special about the Sun's position. Such was Herschel's reputation that this finding, however puzzling, remained unchallenged until 1847 when Wilhelm Struve discovered that Herschel's results had been rendered invalid by his failing to take into account the absorption and scattering of starlight by interstellar dust. Just as you can only see the same distance in all directions while within a patch of fog, regardless of the shape of the patch, Herschel's survey could only see so far before extinction of light by dust cut off his view of stars. Later it was discovered that the Sun is far from the centre of the galaxy. Herschel had been fooled by dust. But how far away were the galaxies? Hubble continued his search and measurements and found that the more distant the galaxy, the more rapidly it was receding from us. This meant the universe was expanding. Hubble was then able to calculate the age of the universe—the time when all of the galaxies must have been squeezed together into a single point. From his observations, he computed this age at two billion years. This was a major embarrassment: astrophysicists and geologists were confident in dating the Sun and Earth at around five billion years. It didn't make any sense for them to be more than twice as old as the universe of which they were a part. Some years later, it was discovered that Hubble's distance estimates were far understated because he failed to account for extinction of light from the stars he measured due to dust. The universe is now known to be seven times the age Hubble estimated. Hubble had been fooled by dust. But the Big Bang was not without its own problems. In particular, in order to end up with anything like the universe we observe today, the initial conditions at the time of the Big Bang seemed to have been fantastically fine-tuned (for example, an infinitesimal change in the balance between the density and rate of expansion in the early universe would have caused the universe to quickly collapse into a black hole or disperse into the void without forming stars and galaxies). There was no physical reason to explain these fine-tuned values; you had to assume that's just the way things happened to be, or that a Creator had set the dial with a precision of dozens of decimal places. In 1979, the theory of inflation was proposed. Inflation held that in an instant after the Big Bang the size of the universe blew up exponentially so that all the observable universe today was, before inflation, the size of an elementary particle today. Thus, it's no surprise that the universe we now observe appears so uniform. Inflation so neatly resolved the tensions between the Big Bang theory and observation that it (and refinements over the years) became widely accepted. But could inflation be observed? That is the ultimate test of a scientific theory. There have been numerous cases in science where many years elapsed between a theory being proposed and definitive experimental evidence for it being found. After Galileo's observations, the Copernican theory that the Earth orbits the Sun became widely accepted, but there was no direct evidence for the Earth's motion with respect to the distant stars until the discovery of the aberration of light in 1727. Einstein's theory of general relativity predicted gravitational radiation in 1915, but the phenomenon was not directly detected by experiment until a century later. Would inflation have to wait as long or longer? Things didn't look promising. Almost everything we know about the universe comes from observations of electromagnetic radiation: light, radio waves, X-rays, etc., with a little bit more from particles (cosmic rays and neutrinos). But the cosmic background radiation forms an impenetrable curtain behind which we cannot observe anything via the electromagnetic spectrum, and it dates from around 380,000 years after the Big Bang. The era of inflation was believed to have ended 10−32 seconds after the Bang; considerably earlier. The only “messenger” which could possibly have reached us from that era is gravitational radiation. We've just recently become able to detect gravitational radiation from the most violent events in the universe, but no conceivable experiment would be able to detect this signal from the baby universe. BICEP1 was a prototype, intended to test the technologies to be used in the experiment. These included cooling the entire telescope (which was a modest aperture [26 cm] refractor, not unlike Galileo's, but operating at millimetre wavelengths instead of visible light) to the temperature of interstellar space, with its detector cooled to just ¼ degree above absolute zero. 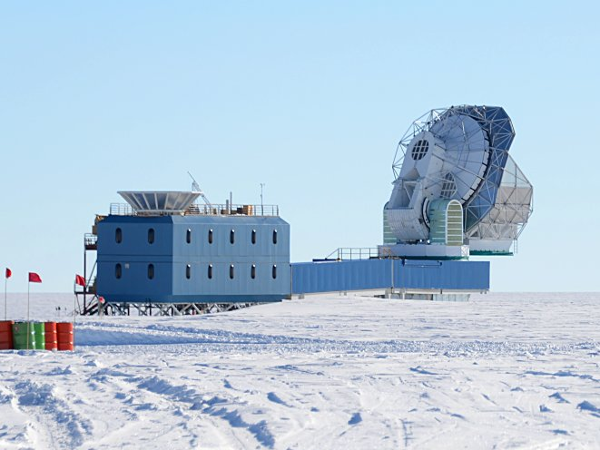 In 2010 its successor, BICEP2, began observation at the South Pole, and continued its run into 2012. 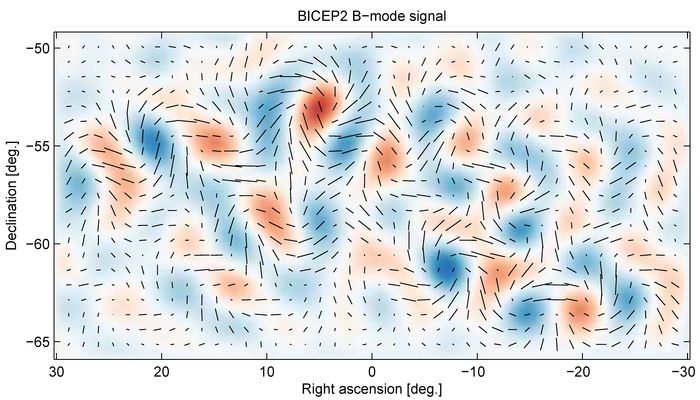 When I took the photo above, BICEP2 had recently concluded its observations. But, not so fast, other researchers cautioned. The risk in doing “science by press release” is that the research is not subjected to peer review—criticism by other researchers in the field—before publication and further criticism in subsequent publications. The BICEP2 results went immediately to the front pages of major newspapers. Here was direct evidence of the birth cry of the universe and confirmation of a theory which some argued implied the existence of a multiverse—the latest Copernican demotion—the idea that our universe was just one of an ensemble, possibly infinite, of parallel universes in which every possibility was instantiated somewhere. Amid the frenzy, a few specialists in the field, including researchers on competing projects, raised the question, “What about the dust?” Dust again! As it happens, while gravitational radiation can induce B-mode polarisation, it isn't the only thing which can do so. Our galaxy is filled with dust and magnetic fields which can cause those dust particles to align with them. Aligned dust particles cause polarised reflections which can mimic the B-mode signature of the gravitational radiation sought by BICEP2. The author, a founder of the original BICEP project, was so close to a Nobel prize he was already trying to read the minds of the Nobel committee to divine who among the many members of the collaboration they would reward with the gold medal. Then it all went away, seemingly overnight, turned to dust. Some said that the entire episode had injured the public's perception of science, but to me it seems an excellent example of science working precisely as intended. A result is placed before the public; others, with access to the same raw data are given an opportunity to critique them, setting forth their own raw data; and eventually researchers in the field decide whether the original results are correct. Yes, it would probably be better if all of this happened in musty library stacks of journals almost nobody reads before bursting out of the chest of mass media, but in an age where scientific research is funded by agencies spending money taken from hairdressers and cab drivers by coercive governments under implicit threat of violence, it is inevitable they will force researchers into the public arena to trumpet their “achievements”. In parallel with the saga of BICEP2, the author discusses the Nobel Prizes and what he considers to be their dysfunction in today's scientific research environment. I was surprised to learn that many of the curious restrictions on awards of the Nobel Prize were not, as I had heard and many believe, conditions of Alfred Nobel's will. In fact, the conditions that the prize be shared no more than three ways, not be awarded posthumously, and not awarded to a group (with the exception of the Peace prize) appear nowhere in Nobel's will, but were imposed later by the Nobel Foundation. Further, Nobel's will explicitly states that the prizes shall be awarded to “those who, during the preceding year, shall have conferred the greatest benefit to mankind”. This constraint (emphasis mine) has been ignored since the inception of the prizes. He decries the lack of “diversity” in Nobel laureates (by which he means, almost entirely, how few women have won prizes). While there have certainly been women who deserved prizes and didn't win (Lise Meitner, Jocelyn Bell Burnell, and Vera Rubin are prime examples), there are many more men who didn't make the three laureates cut-off (Freeman Dyson an obvious example for the 1965 Physics Nobel for quantum electrodynamics). The whole Nobel prize concept is capricious, and rewards only those who happen to be in the right place at the right time in the right field that the committee has decided deserves an award this year and are lucky enough not to die before the prize is awarded. To imagine it to be “fair” or representative of scientific merit is, in the estimation of this scribbler, in flying unicorn territory. In all, this is a candid view of how science is done at the top of the field today, with all of the budget squabbles, maneuvering for recognition, rivalry among competing groups of researchers, balancing the desire to get things right with the compulsion to get there first, and the eye on that prize, given only to a few in a generation, which can change one's life forever. Personally, I can't imagine being so fixated on winning a prize one has so little chance of gaining. It's like being obsessed with winning the lottery—and about as likely. I recommend this book on all three tracks: a story of scientific discovery, mis-interpretation, and self-correction, the dysfunction of the Nobel Prizes and how they might be remedied, and the candid story of a working scientist in today's deeply corrupt coercively-funded research environment.